This is #3 of my Top Ten of 2014! Journey to Cathreay clocks in at a massive 115 pages, 1 page front cover, 1 page editorial, 1 page ToC, 1 page SRD, leaving us with 112 pages of content, so let’s take a look! The module begins with a massive explanation of the module for the DM – essentially, the module provides an extremely helpful explanation of the module’s structure, making the modification on the fly very easy on the DM. A total of 5 maps are provided and a table of all encounters with CR, treasure, XP to be seen at a glimpse. It should also be noted that the pdf also comes with a 25-page NPC-book that has versions of the NPCs of varying strength depending on the number of PCs your party sports – one statblock for 4, 5 and 6 PCs. Indeed, DMs have an extremely easy time with this book – a reference for all animal tricks, beasts, items, rules and spells used in the module is part of the deal – i.e. you ONLY need this book when running it. No book-flipping. (And yes, these take up quite a bunch of pages, but a massive 67 is still left, making this a long module. This being a journey-module, we also get a massive write-up of a caravan resting, with rules for slashing through tents and the like as well as stats for bisons and their handlers – and yes, we actually get multiple stats for guards and handlers, making these guys more versatile than what most modules would provide. This being an adventure-review, the following contains SPOILERS. Potential players should jump to the conclusion – believe me, you’d hate spoiling this one. What about a Jiang-Shi that has managed to stowaway among the people of the caravan, making for yet another complex foreshadowing and multi-part plot that may see an innocent man and his goat exiled. Rescuing a desperate man from a cyclops? Crashing an arranged marriage via trial by combat and potentially winning the freedom of a lady by besting her less than enthusiastic husband to be’s champion? An Elk-hunting mini-game with a megaloceros? The wonders of the journey are plenty and varied indeed. On day 32, the PCs finally arrive at the Khan’s winter palace to a roaring welcome party…during which, their employer bites of more than he can chew and unintentionally makes a bet with the Khan that he (or another of the NPCs with their various plots that the PCs unearthed during the trek) and the PCs can take on Sennacherib. What is Sennacherib, you ask? Well, it is a legendary Tendriculous. , dare I say, MYTHIC adversary. Yeah. And before you say anything – I’ve been using mythic foes as legendary adversaries in my campaign for quite some time and they make for superb bosses against non-mythic groups. However, they imho require proper foreshadowing and the module does a superb job – a fully depicted legend of the creature, extensive and superbly written, makes clear from the get-go that this beast is indeed something to be feared. Even the end of the creature, should the PCs and their NPC-ally prevail, is the stuff of legends. By the way, this is not the only legend provided in the module – remember the fire drake’s cave? I failed to mention that another legend the PCs may have encountered hides the true treasure of the place in an unobtrusive puzzle. Yes. This module has it all. Editing and formatting are top-notch – I only noticed 2 minor typo-level glitches à la “Ncps”. Layout adheres to a printer-friendly 2-column standard that is exceedingly easy to print out. The module comes with a handy NPC-book, varied stats, includes all the rules required to run it, is extensively bookmarked with nested bookmarks and has two versions, one optimized for the US-standard and one for the A4-default used in Europe – awesome! A total of 6 solid full color maps are provided, also as high-res jpgs and the artwork is provided, handout-style, in the back of the module, allowing you to print them out and hand them to your PCs. The artwork is solid, btw., and adheres to a very old-school aesthetic. The last 2 modules by 4 Dollar Dungeons made my top spot of my top 10 list of 2013. “Horn of Geryon” can be considered an apex of the art of wilderness sandboxes. “Panataxia” is one of the best dungeons/planar modules I’ve ever read, regardless of system. Then this one hit my review-list and I was concerned – caravans? Urgh. Two massive potential issues seem to be ingrained in such a scenario – a) the caravan-rules introduced in Jade Regent just aren’t that good and b) such modules are by definition railroads. “Journey to Cathreay” deals with both issues remarkably well – by ignoring the caravan-rules and replacing them with STORYTELLING. You know, with developments, cool wilderness-scenery and a ton of things to do. The second gripe is harder to handle, though – how do you change that up? Via great NPCs and subquests galore the DM can introduce on the fly, by providing varied challenges and options to amp up or slow down the pace whenever required. Then, there would be the potential issue with the final boss and its mythic nature (and no, you don’t eed mythic adventures to run this module – all rules required are provided) – the module manages to properly foreshadow it and makes for a truly epic final fight that is challenging, yes, but NOT unfair. Each combat, each encounter comes with round-by-round tactics, interesting terrain-features and at the end of each section, all relevant skill-checks/DCs are collated into a handy box, available at a glimpse. Richard Develyn seems to be out on a quest to demonstrate mastery in all types of module possible – this journey breathes the spirit of wonder so often lost in fantasy, the sense of exploring a truly different world. The level of detail provided is simply staggering and the world feels ALIVE. It may be ugly at times, it may be hilarious – but over all, these NPCs and places feel like they truly exist, like you could just fall from this world and wake up in the pages of this module. 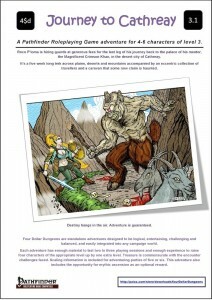 The diverse choices of the PCs and how they matter, the simply astounding, great writing, the unobtrusive, realistic puzzle (that can be brute-forced), the bison-herding mini-game, the hunting mini-game – adventuring is not always a fight to the death and this module shows exceedingly well why one would embark on such a career. PCs actually get to do something that may be considered fun not only for the players, but also for the characters. Add to that the copious amount of read-aloud text, legends, ridiculously easy to use format, the fact that NOT ONE ENCOUNTER in here is boring/common, that creatures get smart tactics and actual background stories/reasons for their actions and we get a module that is on par with the superb predecessors, perhaps even beyond it. Want to know how good this is? My players actually were sad when the module was over. They’ve been badgering me about more 4 Dollar Dungeon-modules ever since Horn of Geryon, and this module took them a long time to complete and unlike every caravan module I’ve ran before, not one of them lost interest even for a short time – invested from beginning to end, this module just blew them away. This beast is long and never loses its stride. When your players refuse to get up from the table at midnight, even though they have to go to work on the next day, when they ask for more roleplaying sessions because they are so into a module, then you realize you have one glorious beast of a module on your hands. This module cements Richard Develyn as one of the best, perhaps even the best, adventure-writers currently active for PFRPG. It’s hard to describe what makes this so impressive, how this quasi-realism and wonder go hand in hand – let it be known that there are few modules that breathe the spirit of old-school gaming to this extent and combine it with all that is great about new school gaming for a result that can only be described as master-class. Modules like this make reviewing worthwhile. Seriously. And then there is the ridiculously low price, the fact that you need no other book to run this. And the rather interesting fact that this module surpasses its predecessors in length. If this review is short on the actual story of the module, then only because I want YOU to experience this beast like I did – with eyes wide open at the wonder that oozes from every page, chuckling at the humor, grinning at the smart encounters and all the details. The writing is so captivating, it also makes for simply a great experience to read and honestly, I’ve read a lot of fantasy novels I found less engaging than this. You won’t find a better bang-for-buck-ratio anywhere. Seriously. This is, by any scale I apply, the apex – if there were 10 stars, I’d slap 10 stars + seal of approval on this book. This is the best caravan/journey-style module I’ve ever read. This is a must-purchase. This module makes me run out of superlatives to slap on it and, at least as far as I’m concerned, may actually surpass its predecessors. This is a hard contender for the number 1 slot of my Top Ten list this year and, barring the means to rate it higher, I’m going for the highest honors of 5 stars + seal of approval. I guarantee you’ll love this module if the idea of a caravan even remotely interests you, if you’re looking for this sense of wonder the old grognards always complain about being absent from most current modules – here is where it lives and breathes and has been blended with all the comfort we now expect. Why are you still reading this ramble? Seriously, buy this. You can get this ridiculously awesome module here on d20pfsrd.com’s shop! Really pleased that you liked it, and thanks for all the time and effort that you gave it in order to publish such an extensive and well-written review. – where I’m currently posting up thoughts and reflections on the adventure that I’m currently writing. Always happy to hear people’s feedback – good or bad.